Will you take some time right now to listen to that little inner voice that may be directing you in a very meaningful and rewarding direction. If you do, my hope is that it is speaking to you about us. 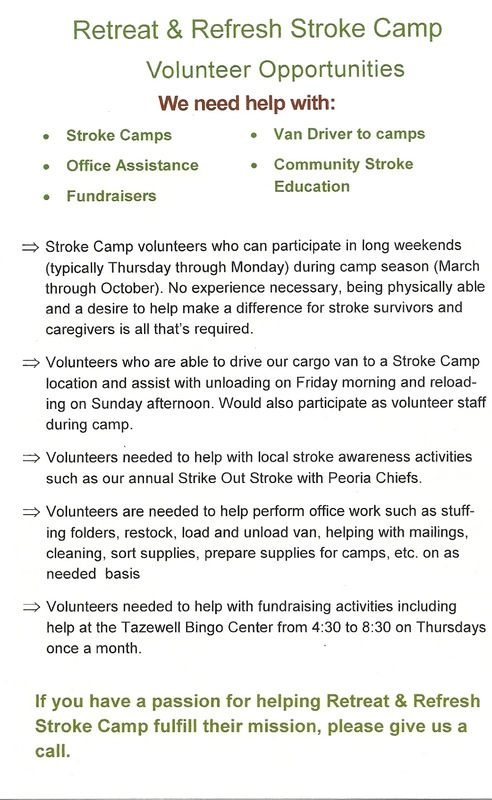 If any of our needs listed below interest you, please feel free to contact us using the phone number or addresses at the bottom of this post for further information or to answer any questions you might have . I would like to take this opportunity to introduce myself. My name is Laura T. Barnett and I live in McHenry, Illinois. I had my stroke in 1980 when I was 23. 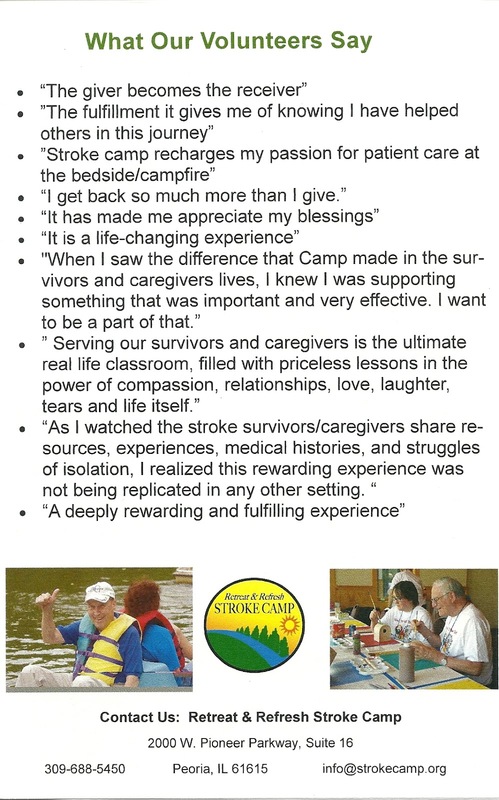 I belonged to Stroke Survivors Support Group in Elgin for many years. Through that club, I found out about Stroke Camp. Since about 2008, I have been going to Stroke Camp once a year. I love it! This is an excerpt from some of Chapter 1 of my book, Blink Twice If You Mean Yes. I had been in a coma for two weeks. Many of you stroke survivors have memories of being totally mixed up. I can tell you for sure that I didn’t know if I was having a bad dream or not. At this time, I wasn’t able to talk or move. Am I Having a Nightmare? Okay, Mom. Is that you? No, it isn’t Mom. I know she’s talking to me because she’s calling my name. But who can it be? I can’t seem to open my eyes. Now, who’s she talking to? Oh, she must be talking to me. That’s right, I’m married now. I used to be Laura Klehr. Now I’m Laura Barnett. Drifting in and out, I suddenly heard the date. WHAT? Is she nuts? Come on. The last day I remember was May 31. No, it can’t be June 15. No, it can’t be June 15! Once again she didn’t even acknowledge me but went right on moving about the room. I can’t believe this! What’s wrong with her? Is she deaf? NO! IT CANNOT BE JUNE 15! A HOSPITAL? What for? Hey, lady! What am I in here for? She must think I’m a real dummy. I heard her the first time. Oh brother! She won’t tell me what’s going on. What is she? A nurse? Most nurses have the decency to answer when spoken to. I don’t understand how it can be the middle of June already. But, because of the different nurses insistent repetition of the dates, it slowly sank in that they had to be right. These people must really be nurses, but I don’t know why I’m in the hospital. I wish someone would tell me! In Blink Twice If You Mean Yes, it is 1980, and I wake up from a two week coma. Unable to talk or move, I discover that the nightmare that I thought I was having is real. 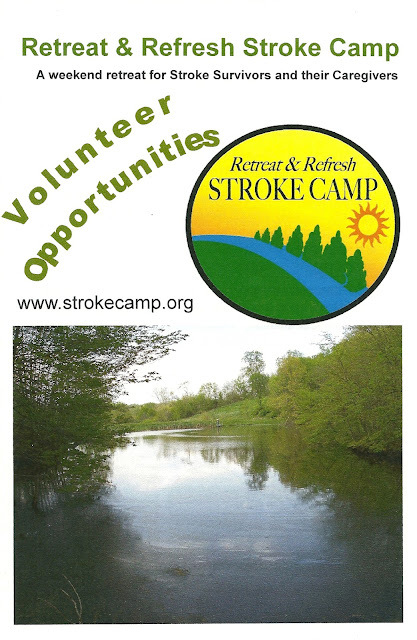 Only later do I find out that at age 23, I have suffered a rare brain stem stroke. Through the blinking of my eyes, I have a tiny peephole into communicating with my family, friends, and the hospital staff. God forged a strength and determination in my soul that allowed me to walk out of that hospital four months later. However, I wasn’t aware that it was God. Because I was headstrong in the ways of the world, I thought this inner resolution was of my own making. God will allow us to go through something that seems ridiculously unfair because He needs someone to go through difficulty and come out victorious for His glory. When people have been through a great hardship, and they come out whole, sane, happy, and joyful, it makes others think, maybe I can do it. I could have given up! That would have been the easy way out. Threaded uniquely in my journey is the progress from the isolation and alienation from God of a secular person to moving gradually to spiritual discovery. Searching for the purpose of my stroke, I miraculously come to faith in Jesus fourteen years later, March 1, 1994. When I committed my life to Christ, I found the answer. Because of my disability, my life since Christ has not been trouble-free. There have been broken bones, surgeries, the challenges of daily living, and then a divorce. My left arm continues to be disabled, and both of my legs are relatively useless. Yet through all of this, God sustains me and gives me joy. He is so awesome! I give God all the glory! 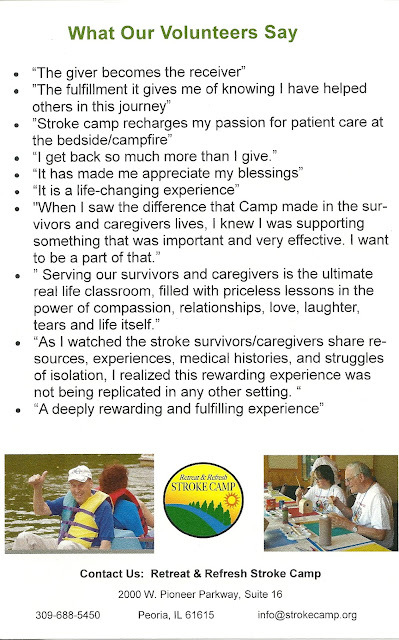 A survivor’s emotional response to anything and everything may change a little or drastically in the post-stroke world. Some report spells of endless tears and then laughter or vice versa. A kind deed or moderately sad tale may turn them into a waterfall. A childhood joke may send them into convulsing laughter. Depending on the stroke’s location, the brain injury may jumble or exaggerate emotions. The doctor may diagnose certain conditions that explain these behaviors. As the caregiver, you have the challenge of paying attention to these changes and discovering their triggers where possible. Also make sure you don’t ridicule what may seem like a childish response. It’s exhausting and frustrating to control out-of-control emotions, even if they’re as harmless as laughter or tears. Reassure them it’s okay and it’s not them; it’s the stroke. Help them feel more comfortable around others and to create signals or words that indicate they want or need to leave when they experience these difficult emotional moments in public. Remember, a caregiver's arms are the strongest safety net in the world. During a visit, a family member saw the stroke survivor successfully raise her affected leg three or four inches off the ground and lower it. That was quite an accomplishment, but the visitor decided to have some fun. “Oh, I didn’t see that,” she said, in a totally innocent voice. The survivor played along. With a smile, she repeated the motion. Isn’t that just a little more enticing than, “Lift that leg”? Different fuels motivate us when we don’t want to do something or struggle with the task awaiting us. That’s just being human. Survivors battle even greater challenges, and we can lift that emotional load significantly by adopting some new game plans along the way. • Say “Don’t you do that!” in a playful tone. That often has the desired effect in encouraging them to do just the opposite. • Use bribery whenever and wherever possible. Make it fun! And just like the shampoo bottle says: shampoo, rinse and repeat. Only this time: smile, challenge and repeat.